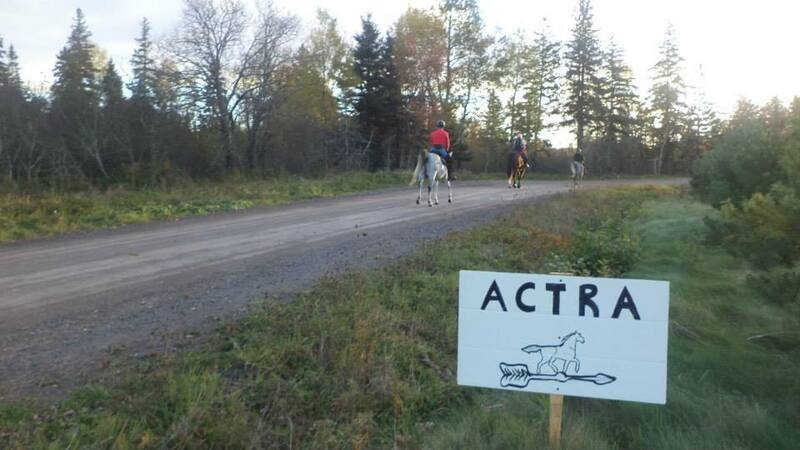 The Atlantic Canada Trail Riding Association (ACTRA) was formed in 1980 to promote distance riding, standardize the judging of same, encourage good horsemanship, promote the use of sound and sensible riding mounts, and above all to enjoy your mount in the company of people with the same interest. If you are looking for a new challenge to help you and your equine partner set new goals, look no further! Are you ready to experience the challenge, the satisfaction and have FUN competing? Competitive Distance Riding provides all that and more. The camaraderie you will experience is worth the entry fee. Our rides offer well marked safe trails, judges and vets that are knowledgeable in distance riding who will check your horse before, during and after the competition. You will usually have meals and awards included in your entry fee and a safe place to park your truck and trailer. There are always people around to ask when you have a question and you will almost always wind up with more information that you bargained for. You are guaranteed to have fun, make new friends and learn more about your horse! Come on out and join us! Competitive Trail (CTR) / Introductory Distance (IDR) Rides, Judged Pleasure Rides (JP), Ride and Tie (R&T), and Endurance (End) / Limited Distance(LD) Rides. "We believe in the motto of the American Endurance Ride Conference - "To Finish is To Win"
"Our mission is "To promote the safe and ethical use of equines in distance riding"
Please check our website often for updates on clinics and our other sanctioned events. Please feel free to email any one of the Board of Directors to ask questions!